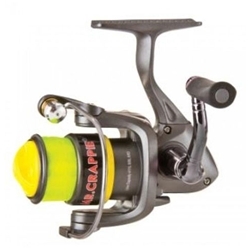 The Mr. Crappie Slab Shaker Spinning Reels have a graphite body rotor and spool with a 32 point multi-stop anti-reverse. Features a 2 Bearing construction and a smooth operating front drag system. The Perfect Reel for any Crappie Fisherman, it is adjustable for right or left hand retrieve and come pre-spooled with premium Mr. Crappie Hi-Vis line!